On September 1, 1994 pacer B K Bentley with Gregg Haston crossed the finish line to become the first legally bet horse in the State of Indiana. A crowd of around 8,000 were on hand with an additional 2,000 turned away from the not totally completed facility. Good fortune would not last long for either driver or facility. In 1996 Haston was killed in an automobile accident but is still remembered each year with a memorial race and leading driver title in his name. 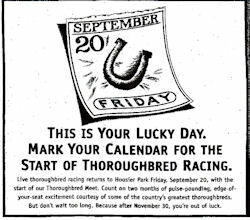 The track which also begin thoroughbred racing in 1995 had a monopoly till 2002 when Indiana Downs opened fourty miles down the road. The new track claimed half of the subsidy Hoosier Park use to count on and both tracks lost money. Fortunately there was a happy ending. Hoosier Park which was struggling received a boost when it was granted a Racino license in 2008. Hoosier Park now has a purse value of 42 making it one of the top tier tracks in the country. In 2011 Hoosier Park and Indiana Downs rotated thoroughbred and standardbred seasons as normal. Leandro Goncalves won the riding title and Peter Wrenn captured his third straight Gregg Haston Driving Title. In 2012 Hoosier Park was converted to race only standardbreds, while Indiana Downs took over thoroughbred racing.